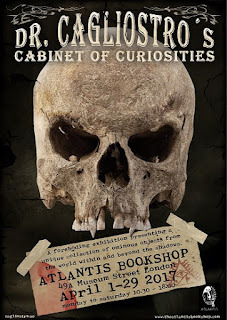 The Atlantis Bookshop, in London, has an exhibition of Dr. Cagliostro's Cabinet of Curiosities for the month of April. In the shop's basement temple this month, you'll find many mysterious items from Dr. Cagliostro's collection, including a vampire-hunting kit, mermaid skeleton, werewolf footprints and shrunken heads that defy explanation. This is yet another world-first for The Atlantis Bookshop: never before has this free exhibition been provided to the general public. Shop owner Geraldine Beskin said: "Please come along and immerse yourself in one of most peculiar and alternative exhibitions you're ever likely to see. It is with us from 1st - 29th April and we can also offer you a copy of the full colour book detailing many of the items in the collection, priced at £27.99, as a memento of your visit." The Atlantis Bookshop is open Monday to Saturday from 10.30am-6pm. It is at 49a Museum Street, Bloomsbury, London WC1A 1LY. Telephone: 020 7405 2120.